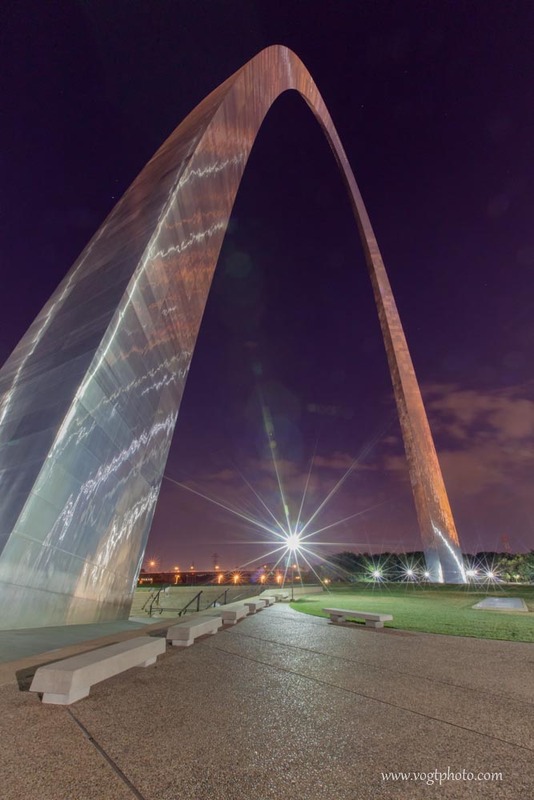 The Gateway Arch, also called the St. Louis Arch, stands an impressive 630 feet tall. 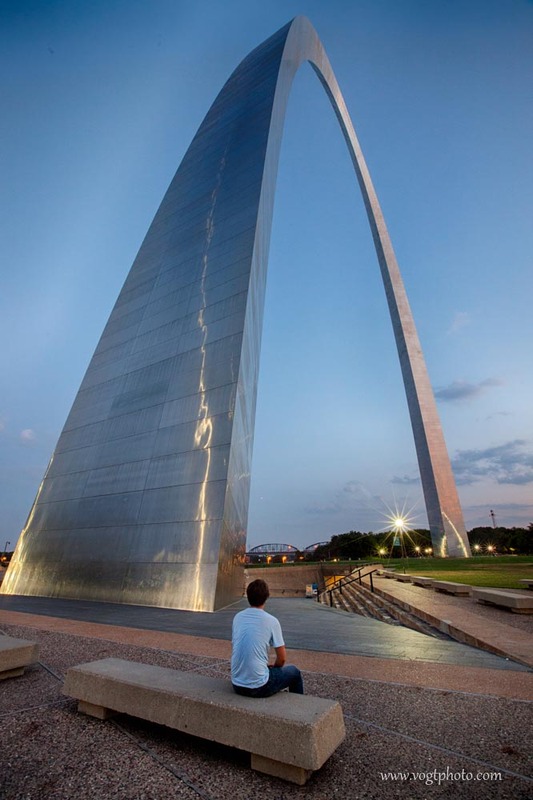 In fact, the Gateway Arch is not only the tallest building in Missouri, but the tallest arch in the world. Originally conceived in the 1930’s, the Arch was designed in the 1940’s, and finally built in the 1960’s. I was only in St. Louis for an evening, so obviously had very little time to explore the city. But I am glad I took the time to visit this amazing piece of architecture and engineering. 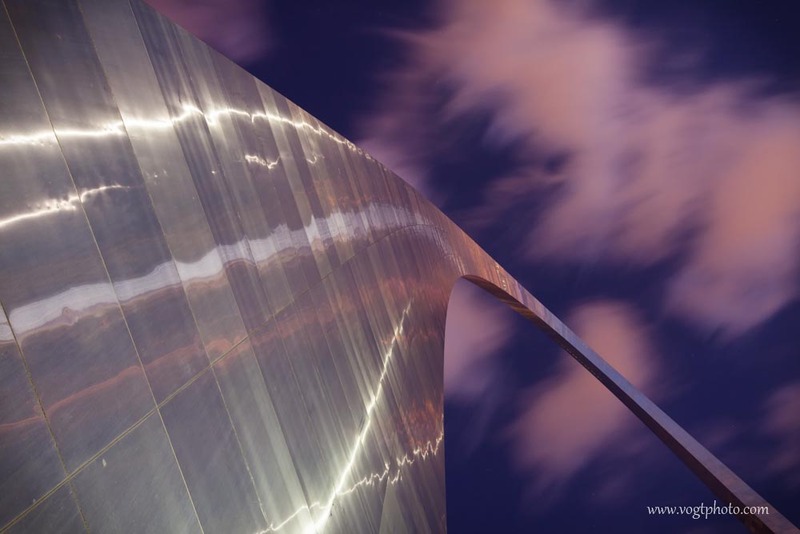 Before even arriving in St. Louis, I knew I wanted a to use the unique shape of the arch to create a few unusual and abstract compositions. But once I arrived and saw the shear size of this monument to westward expansion, I also wanted to find a way to capture the incredible scale of it. Maybe it was blind luck but I walked away from the arch with few images that I really enjoy and think capture a bit of the awesome and unique beauty that is the Gateway Arch. Looking up the south leg of the arch. 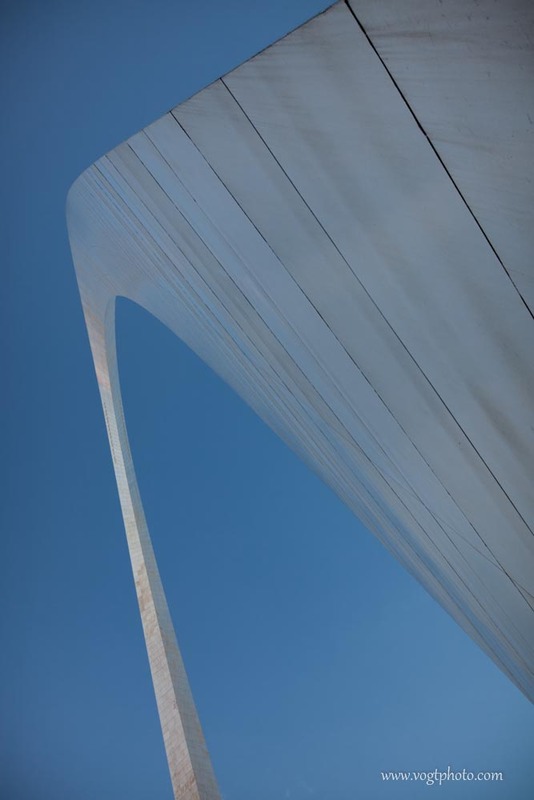 In the above image, you can barely see the windows of the observation deck at the apex of the arch. Cheesy self portrait. Regardless of the cheese factor, it’s pretty clear the St. Louis Arch soars into the sky. The curves of the arch make for some interesting compositions. 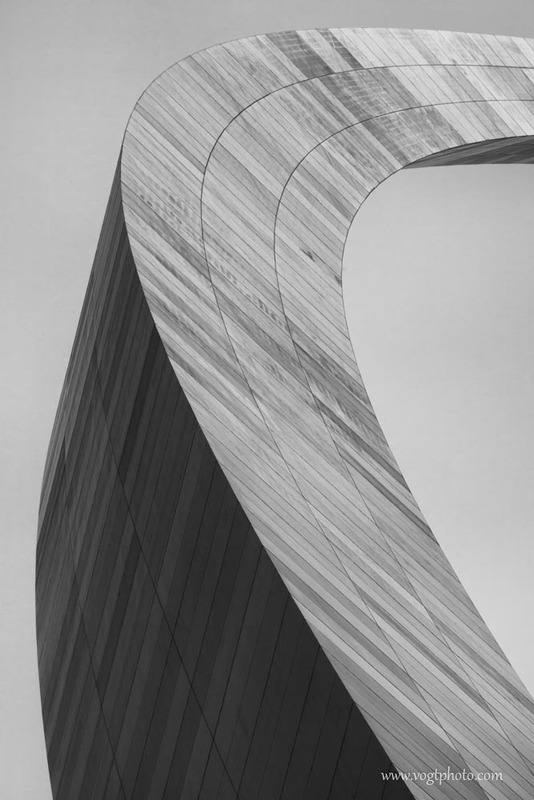 Even though the arch is clad in stainless steel, corrosion does build up with time; the results of which are more evident in this black and white image. It really is strange how one panel can have much more corrosion than even panel right next to it! Maybe it is my introvert personality, but I was drawn to the row of empty benches and had to take their picture. In fact, a group of street performers were just out of site to the left of this image and I carefully crafted this composition to exclude them. Besides, I wanted the street lamps in my image to have that “star burst” look, and to do so, my camera required an exposure time of of several seconds. Those moving street performers would have been nothing but blurry blobs…give and take, I guess. As a landscape photographer, I am always stressing out over clouds. Clear blue skies are boring but total overcast is equally bad. I had spent the majority of my time at the arch under clear blue skies, but as the sun dropped below the horizon, I saw a small group of clouds drifting toward the arch. I anticipated where the clouds would pass, and waited for my opportunity. The fast moving clouds streaked across the sky during the 30 second exposure, giving the clouds a unique and more dynamic feel. This is gorgeous. We want to take a group photo of about 8 people at the angle of your photo on the bench (The cheesy self portrait which is not at all cheesy!) What lens do you recommend to capture the tall arch? Hi Karen. If you want to capture the whole arch with people as well, you will need a wide angle lens. The wider the better. I recall taking this picture with a Canon 16-35mm lens (at 16mm is considered ultra-wide).